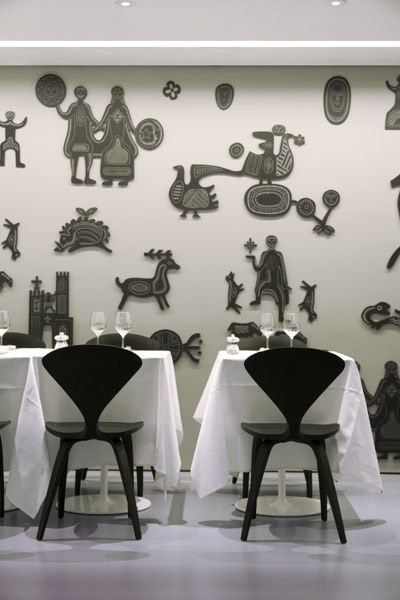 The intention, when designing this new venue of the London brand OLIVO, was to narrate about Sardinia (its proprietor’s home island) through iconographic references to the main points of its traditional economy (handicrafts - weaving, in this case - and sheep farming) and the quotation of the works of a Sardinian contemporary artist, Eugenio Tavolara, who remarkably contributed, along his whole lifetime, to bring out and safeguard the traditional culture of that island. Far from wishing to evoke Sardinia through trite images good for “low cost” tourism, my tale has been told with a language which winks at contemporary design, also resorting to the work of some skilled Sardinian artisans who have moulded a huge bas-relief of bucolic inspiration and given life to a crowd of peasants, horsemen, shepherds, wild boars and hunters which animate the restaurant’s walls. 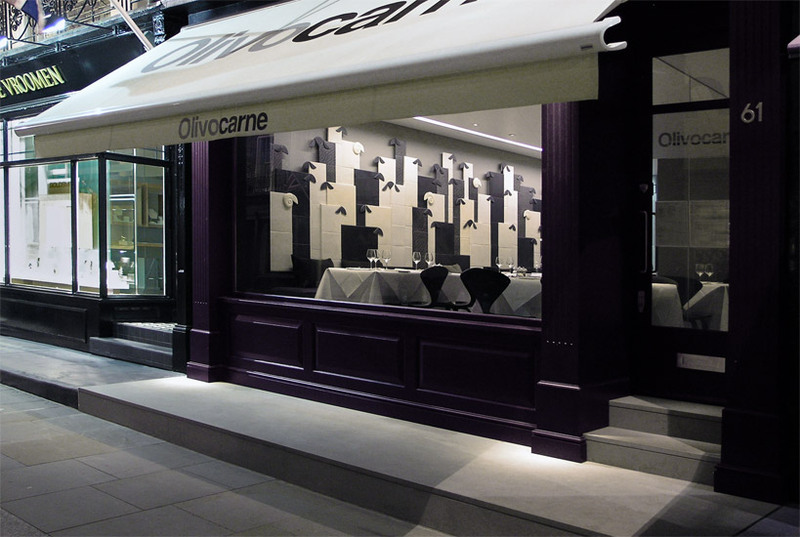 The access to the restaurant and its appurtenances opens on the aubergine coloured shopfront. The solid wall which previously divided the entrance from the dining room facing the street has been knocked down and replaced by a full height fire resistant glazed divider, so to give a visual opening and more breath to otherwise too compressed spaces. 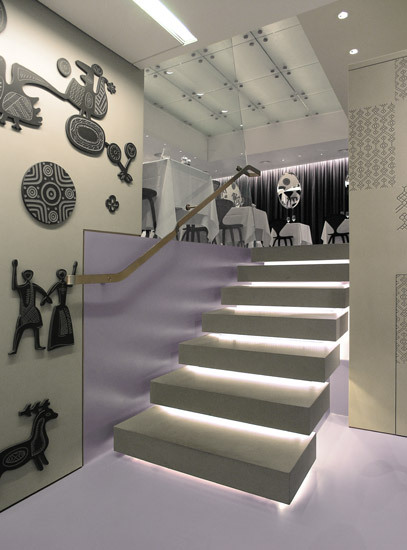 From the entrance lobby one can access the stairs leading to the upper floor, where is a two rooms bar and a small terrace for smokers, while entering the restaurant one immediately faces a wall cladding in relief - made of texturized and waxed terracotta tiles - evoking a flock of sheeps (artwork by ceramist sisters Stefania and Cristina Arìu) and working as a background for a range of tables and chairs made of dark brown bent oak plywood. 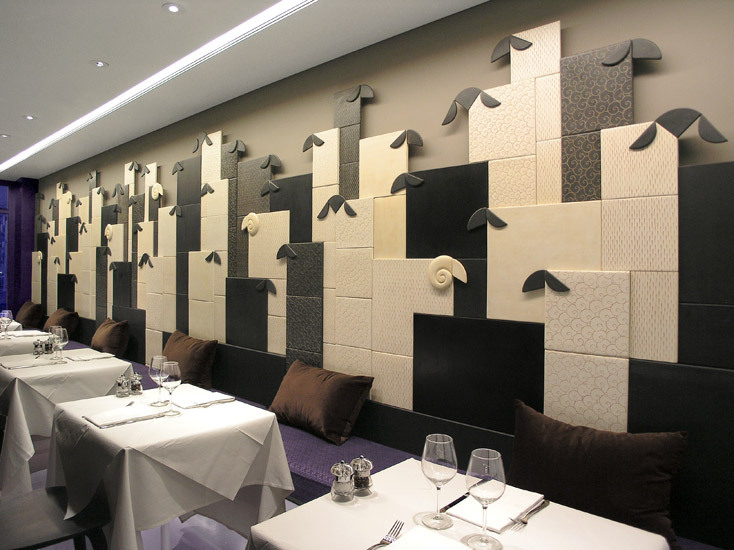 Along such cladding runs a suspended upholstered banquette, covered with a traditional Sardinian fabric. Opposite to such wall, on the right as per the entrance, is the reception area, equipped with a dark brown oak sideboard and the manager’s electronic appliances. 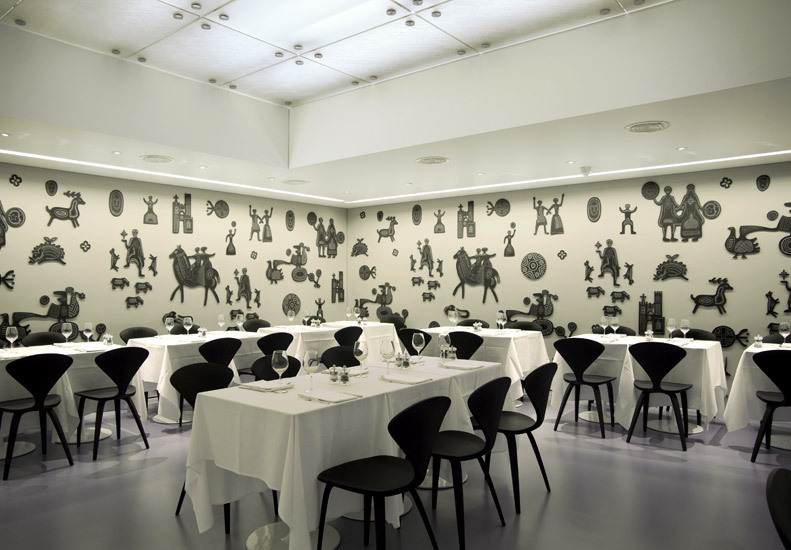 Proceeding towards the inner space, one goes through an intermediate dining room marked out by the use of a rather saturated pastel colour (typical of south Sardinia decorative culture) and by an other suspended and under lit upholstered banquette, covered with a black and white wool and cotton fabric used to manufacture pack- saddles typical from the village of Samughéo, in times - now gone by - when horsemen’s provenance was detectable by the pattern of the fabric woven in their home villages. In this same room also appear some introductive elements to the upper dining room located at the rear. 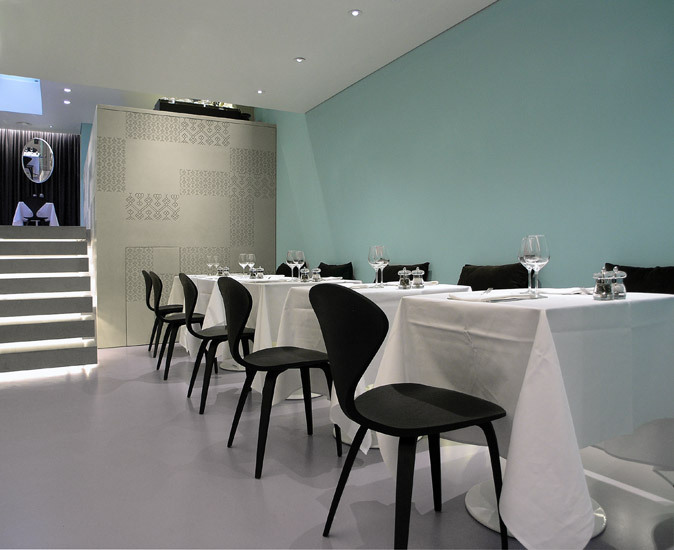 Stepping on a short under lit stair made of Pietra Serena, one gets over a difference of level of about 1,40 metres, gaining access to the widest space of the restaurant, a well proportioned dining room with several tables and seats, as well as an important bar area. This last one essentially consists of a wide counter running beside the steps and leaning, with its side elevation, forward the intermediate room below. 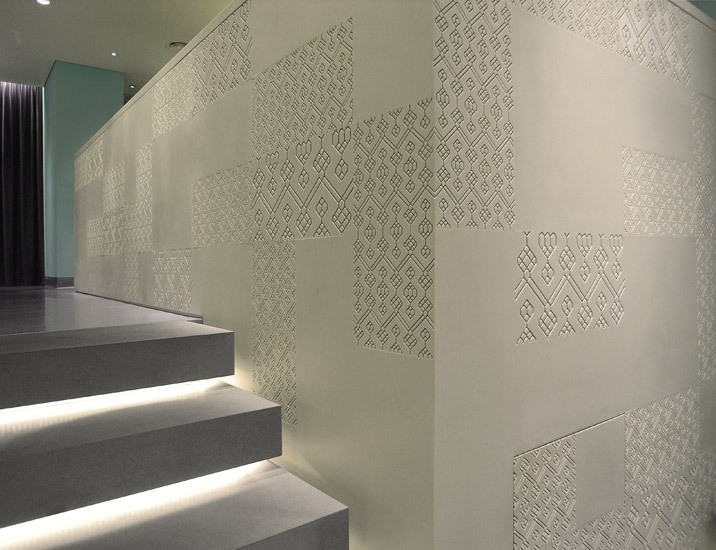 Such counter is entirely covered with dove grey Corian®, partially carved according to a pattern drawn on from carpets traditionally woven in the Sardinian village of Mògoro. 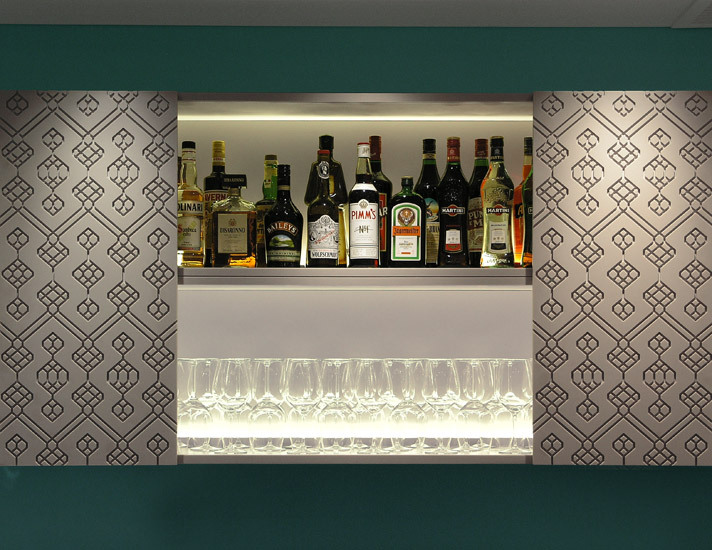 Behind the counter two long box-like shelves, made out of Corian® as well, characterized by horizontal and vertical sliding panels engraved with the same pattern as the counter, provide enough room to store bottles and glasses. 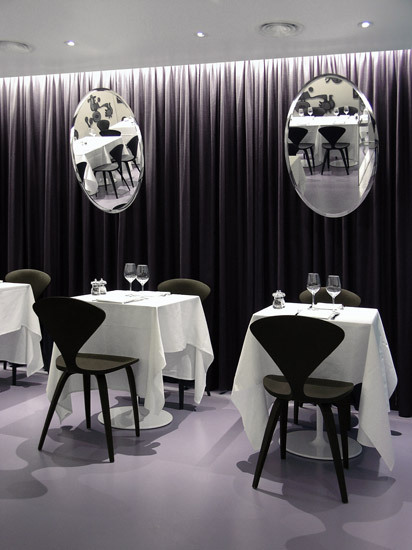 The facing dining room – covered by an about 17sqm wide skylight providing copious daylight diffused by glass panels engraved the same way – features a bue/purple linen curtain covering a whole wall, from the drapes of which come out four backlit oval mirrors with grinded edges, looking like they were floating with no supports at all. 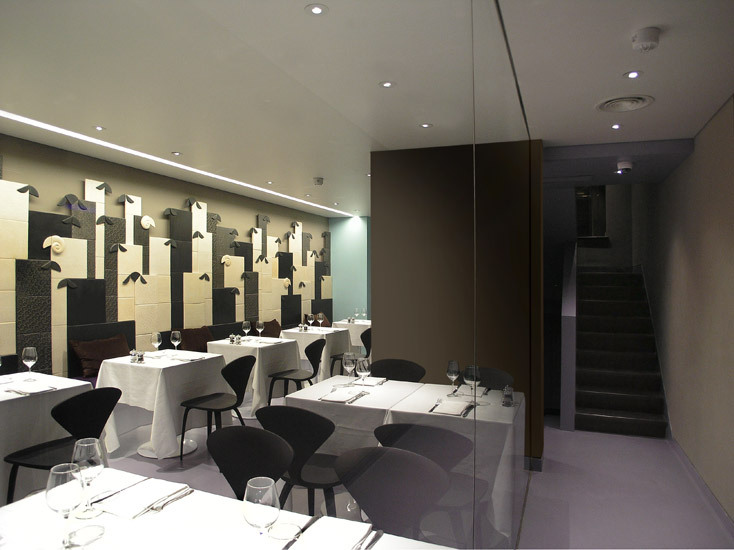 The remaining two walls are entirely covered with dove grey Corian® panels with totally invisible joints. On their surfaces have been spread hundreds of figurines in relief (made and engraved out of dark brown Corian®) portraying stylized animals, folks and various elements of the traditional Sardinian iconography (artwork by Mauro Angius), inspired by the work of the highly esteemed Sardinian artist - who performed as a sculptor, engraver, ceramist, illustrator and designer between the ‘30es/’60es - Eugenio Tavolara. As an apparent interruption of these decorated surfaces (which, instead, turn down towards the intermediate dining room below, preparing visitors to the surprise they’ll find upstairs) has been installed a full height frameless trapezoidal glazed divider which provides protection against falls on the steps below and is completed by a bespoke brushed stainless steel handrail. 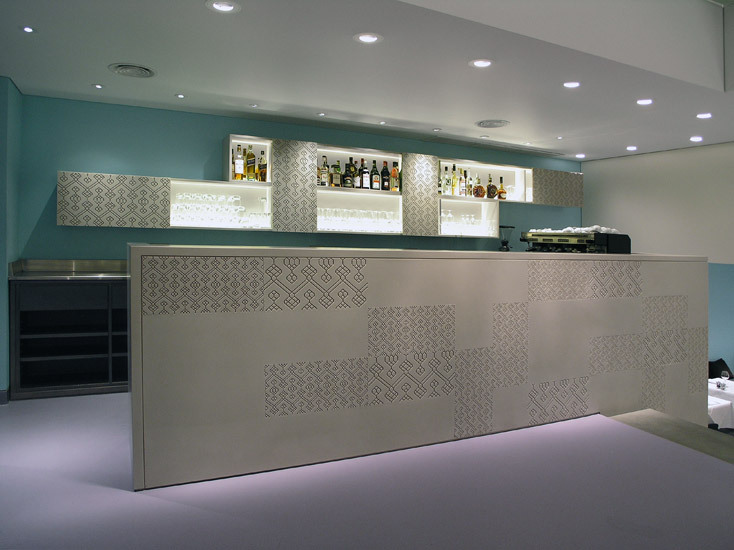 The suspended ceiling is a micro perforated thermo-stretched membrane performing as a sound absorbing surface. In such membrane have been integrated all recessed light appliances, including the asymmetrical linear ones providing washing light for all decorated walls. A gray/purple continuous floor chromatically links together all features of this interior.